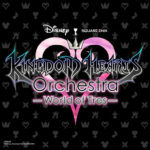 With Kingdom Hearts III releasing on January 29th, 2019, a new concert series of the popular game franchise will tour the world as Kingdom Hearts Orchestra -World of Tres-. Beginning on April 27th, 2019, the tour includes stops in 17 cities, some with multiple performances. Only one Canadian city made the list — Toronto, Ontario. Each show includes selected scores from 15+ years of Kingdom Hearts games and set to scenes from these games. Pre-sale tickets for certain cities start on January 30th, 2019, with the public able to purchase tickets on February 12th, 2019 through La Fée Sauvage.